A gorgeous calligraphy pen, check. A free hour of your time, check. Paper for calligraphy writing? No? Our team at Blots Pen & Ink Supplies have been solving problems like this for close to 25 years and can provide you with quality calligraphy paper. Our range of calligraphy paper can give your writing a distinctive edge and ensure that the ink grips to the paper quicker and with purpose. After the ink has found its way into all the nooks and crannies of the paper, it leaves a unique appearance to the writing. We stock a wide variety of pads and paper for calligraphy writing in both A4 and A3 sizes. Whether you’re deciding on marque paper or smooth Conqueror, we can cope with your requirements. Our Conqueror paper is perfect for Copperplate and Spencerian script because of its silky exterior and is a quality paper with 100gsm. We give you all the equipment to create beautiful writing and wonderful fonts with our range of pens, inks and paper. Whether you’re looking to top-up your paper supplies, or you want to venture into the calligraphy sphere, take a look at our website. To find out more about our products, why not get in touch with us. We’ve found this great video course you can use to get started with Calligraphy. The selection of ink is a very personal choice. There is no ‘best‘ ink – only the right ink for you and the application for which you want to use it. The safest rule with all fountain pens is to use the ink recommended by the pen manufacturer. Fountain pen inks then divide into dye based or pigment based. Dye based fountain pen inks are thin to aid their consistent flow through the pen and though they are often available in a variety of colours they are essentially ‘fugitive’ and will fade on exposure to light. Pigmented fountain pen inks are made from very finely ground pigments that allow the ink to flow through the pen but offer a higher degree of permanency for the finished writing. ‘Permanent’ refers to the lightfastness of the ink – it does not mean waterproof or water resistant and waterproof does not mean permanent. Most fountain pens, even when used with fountain pen inks, will benefit from an occasional flush through with clean water. A filler convertor can be used to draw water into the pen and expelled repeatedly until the water coming out is clear. If the pen is blocked or has been left for a long time it may help to soften any blockage by filling the pen with a solution of washing up liquid and leaving overnight before flushing through repeatedly with clean water. Iron Gall Ink is not dye based, carbon or pigment. The ink gains its distinctive dark blue black colour from the chemical interaction of wood tannins with sulphate of iron. It darkens on reaction with air and its acidic nature eats into the paper. It is highly valued by Copperplate calligraphers for the fine detail the ink produces. It will eventually turn brown but you will need to wait probably a century for this to happen. Which penholder should I choose? Right-handed calligraphers – use an oblique pen holder as this helps to hold the pen at the correct angle for copperplate writing and also gives you a wide choice of nibs; or a straight penholder with the angled Mitchell Copperplate nib (though this choice restricts you to this single nib). Left-handed use a straight penholder because your arm and hand are already at the correct angle. There is no “best nib” for Copperplate or Spencerian writing. I normally advise beginners to buy a selection of nibs to try as the most suitable nib is a very personal choice. All the flexible nibs suitable for Copperplate vary in their size, flexibility and strength (pressure required). One person’s favourite nib might be unsuitable for someone else. One unbreakable rule is to be ruthless is discarding nibs that have begun to wear as they will never again produce the fine hairlines that distinguish this style of writing. All these nibs and holders can be found in our Copperplate Calligraphy area. We also stock various copperplate selections, which include an oblique penholder, nibs and some with ink which are suitable for Copperplate. Calligraphy (beautiful writing) is an ancient art, but sadly, one that is increasingly rare in the modern digital world. The next generation of children will be typing on smart phones and tablets long before learning to write, let alone using cursive writing or a fountain pen. Some schools in the USA have withdrawn cursive writing from their lesson plans and from 2016 schools in Finland they have abolished joined up handwriting altogether in favour of teaching typing skills. Whilst it may to be true that typing will be an increasingly useful skill in the modern world, it’s important that children still learn to write by hand. Calligraphy can not only be a great hobby, but can provide career opportunities as well. It can provide a way into art industries, open up other creative avenues and unlock other potential talents. With the bank holiday weekend approaching and the potential requirement for some ‘wet weather’ activities, we thought it would be good to give you a guide into how to encourage your children to try their hand at calligraphy. Children can be easily distracted, a fact I’m sure I don’t need to point out to most parents! To keep their interest, it’s important to create an uncluttered work space with all your planned activities readily available at hand. Make sure all of the tools required are ready to go and neatly laid out. It might be worth having a variety of different pens/crayons available and not just calligraphy pens and ink, especially for younger children. Have some different types of paper available, from ‘rough’ note paper to nicer writing paper and some lined paper for practicing lettering. You could have some examples, or the alphabet, already written out for your children to copy. If you are a calligrapher yourself, show your child how you can write out their name, or favourite pet’s names. This is something close to them that they can connect with. You can look through some calligraphy books together, or to engage with their modern minds, watch some examples of calligraphy on YouTube using a tablet. Calligraphy has a wonderful history, and you can take this opportunity to take your kids into the worlds of ancient China and Japan, the Egyptians and Medieval Britain. You could print out the Chinese lettering, or hieroglyphs which translate into your child’s name, and get them to replicate that. One of the biggest struggles with children and calligraphy is how they hold the pen. In general, kids will hold a pen rather awkwardly and will lack the dexterity or deft touch required for advanced calligraphy. However, it’s important to remember that we’re not creating masterpieces here, we’re having fun whilst encouraging our children to learn some history, help their creative learning and hopefully set them on the path to a new hobby. If they want to practice lettering, great! If they would rather draw pictures of their friends or pets then that’s fine too. Let them be creative in their own way and you’ll be surprised at what they can achieve. When you’re finished for the day, ask your children which of their drawings or writings is their favourite. Make sure this piece gets pride of place on the fridge, mantelpiece or wherever it is you may keep your kid’s artwork. They will hopefully feel a sense of achievement and they’ll be itching to get the pens back out again! After your first session, tell them that you’ve got a very special gift for them; their very own notebook. Tell them that this notebook is for them to practice writing, doodling and drawing, and that you’ll go through what they’ve practice next week, creating ‘nice’ versions of it on good paper. Paper: While any writing paper will do and photocopy paper is adequate, we all like a nice pad to work on and children do like one they can mark as ‘MINE’ and their sibling doesn’t draw in! We recommend the Frisk A4 Layout Pad There are many other options available on that page. Calligraphy Pen? See our blog for Starting Calligraphy for an idea about starting calligraphy and working with just two pencils and a rubber band. You can use bits of card, lollypop sticks, felt, foam, balsa wood… cut crayons into a square ended pens. Kuretake coloured calligraphy pens, singles and sets of 4 or 8, are brilliant for experimenting with coloured letters and last extremely well. Ink If you buy ink it’s best to look for the ‘washable’ versions as it makes bath time and laundry so much easier. Poster paints from the pound shop are great value – anything, so long as it makes a mark on the paper. Whilst you’re online take a look around the rest of the Blot’s website as we have a fantastic range of Calligraphy pens, pads, paper and other craft materials. Let us know how you got on by commenting at our Facebook page! Calligraphy means beautiful writing. In our modern world we are very familiar with clear, sharp and stylish lettering most of which is produced by computers. Handwriting with a pen is a different story. For many of us the only writing we do will be a scribbled shopping list; a note for the milkman (what’s a milkman?) or a quick message in a birthday or Christmas card! For many of us our writing is not in the wildest imagination beautiful. However, Calligraphy is not restricted only to those who are artistic; have studied and practiced for years and have mountains of expensive equipment. Most people who spent a morning with simple pens and paper could, with a little guidance, start to write beautiful letters. Calligraphy letters are drawn to set proportions, otherwise the letters appear tall and lanky, or short and dumpy. The proportions relate to the width of the nib. The height of the simple letters (a, e, o, x..) is four and a half or five nib widths. This is called the ‘x’ height. Other letters have a stick or ascender which goes up (b, d, h..) or down descender (g, p, q..). The Round or Foundational letters are based on a circle; Italic letters are based on an oval. 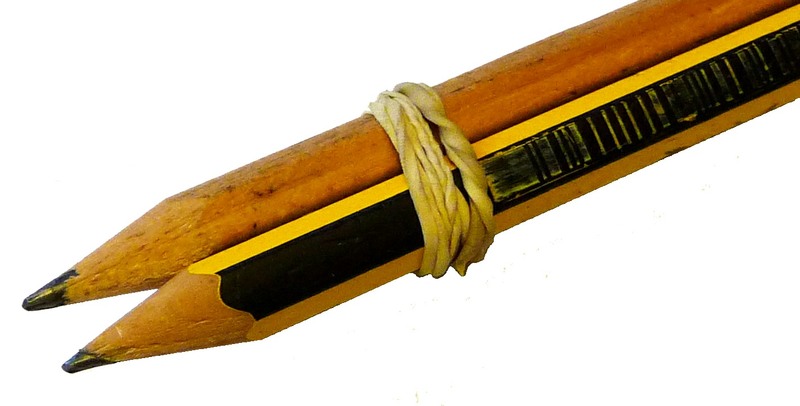 A simple start can be made by putting two pencils together with a rubber band. All rules in calligraphy are there to be broken. However a good rule is to first learn how to do them consistently and correctly before breaking the rules. There are many different forms of letters and you will find many variations. Round Hand or Foundation are the letters that most people try first. A square cut calligraphy nib is designed to be pulled or slid across the paper. If it is pushed it will probably dig in and splatter ink on your page. Each letter is formed with separate strokes. The graphic above will give some idea of how some calligraphic letters are formed. Letters can be drawn using the two pencils, a broad square felt tip pen or a calligraphy pen. It is best to practice the simpler letters of the alphabet first. The emphasis is always on practice. Do not be discouraged if your initial attempts are very varied. Draw lines on a sheet of paper (have plenty of paper available – photocopying paper is ideal). For Round Hand letters use an ‘x’ height of 4½ nib widths; and 4 nib widths each for the ascenders and descenders. Start by exploring the pen at different angles and see how the pen produces thick and thin lines. These variations are what characterises a calligraphic letter. Hold (and keep) the pen at 30° to the horizontal and draw a circle. Try copying the letters below. Blots Pen & Ink Supplies was officially started on 1st August 1993 so today is our 21st birthday! I started from the boxroom, soon took over the back bedroom but really got into trouble when my wife found drawing boards under our bed. After a few years lifting cases of ink into the loft, and down again, I moved Blots into units in Bury Business centre. Finally we moved into Blots comfy bungalow at the bottom of the garden. I am amazed that my video which shows colour mixing with Pilot Parallel Pens and had some distinctly dodgy calligraphy has had 36,000 hits!! It was never intended to demonstrate calligraphy but just to give an idea of what colour mixing was about. Apparently it has learnt 9pence and they don’t pay out less than £10 so I don’t think I will be booking the cruise yet. I suppose that 36,000 as a percentage of the world online community isn’t great but there are lots of videos with much smaller figures. I just wish 36,000 people had bought a Parallel Pen from me!!! If you want to see it – 36,001 – just search for ‘blotspens’ on YouTube. No it’s not the Chocolate Charlie one; it’s the other one.